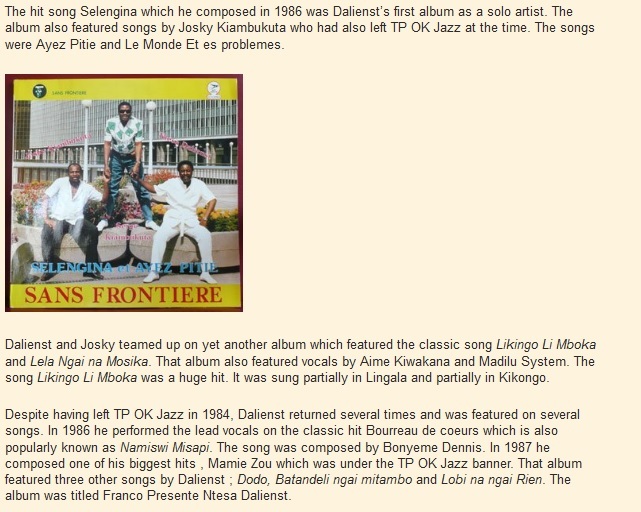 This entry was posted in African musicians and tagged African Musicians, Ntesa Dalienst. Bookmark the permalink. 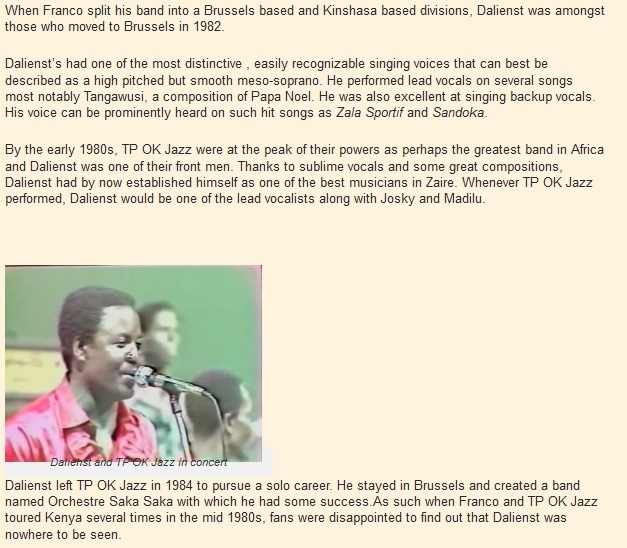 Ya Ntesa, TP OK Jazz was teeming with talent but you were my best. I was in denial for very long over your demise. In my opinion, the best vocalist of all tyme. My favourite being Liyanzi ekoti ngai motema. Timeless piece. Was very calm gentleman, we will always miss you Ntesa. So sad how a number of music greats are just passing before our eyes so prematurely, especially the TPOK family. This guy had all the stamina and delivered most powerful yet harmonious timeless pieces. 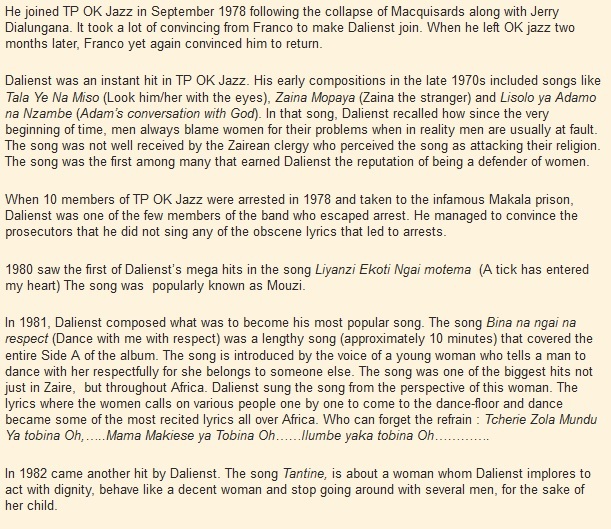 I am in particular wowed by lisolo ya adamo na nzambe, mukungu, namiswi misapi etc. Memories are made of these! 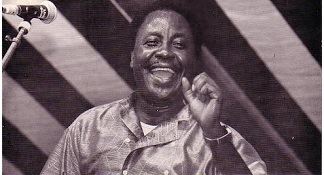 At the Nairobi City stadium in1983 he gave me a small booklet with the History of TP OK jazz which I treasure to date. I love listening to his hit Dodo any time. Fare thee well. The ease with which he sang, almost effortless,yet you can see his neck blow and flatten like singing bull flog, then you realise this guy is in business. Check him on his video tangawizi and coupe de foundre, you will be happy. True you are a real fan; Bina na ngai na respect, mouzi ,dodo and Tangawuzi, the backup voice in DIA and Sandoka was marvelous. These days there is no music. Ok JAZZ music will live for ever. When i hear Ntessa’s voice i can easily sob in tears. 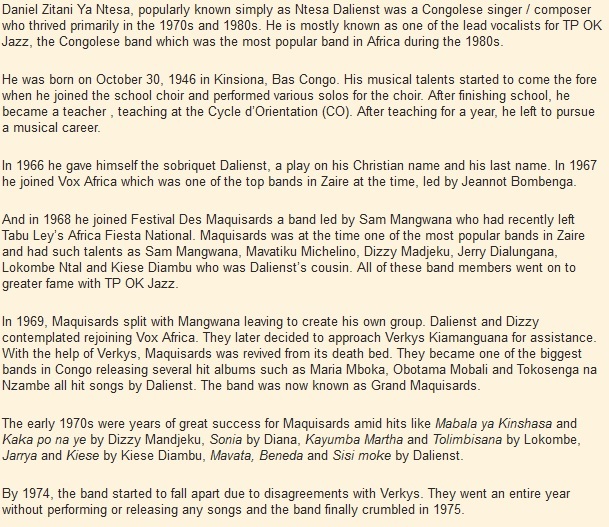 Ya Ntesa was a highly gifted musician of all times.